-- 7:00am: Wake-up Anna ... I wound up not pumping last night and have been waiting for her to stir for about 30 minutes, she *needs* to eat, if you know what I mean. Feed while watching The Today Show. -- 7:40am - 9:10am: Breakfast for Mom, playtime, visit with Dad, discuss Anna's Emergency contacts for daycare (they have to be local and we've been debating who to ask for over a week), fold the load of whites I meant to fold after dinner last night. Daisy mimics Anna on her activity map, see below. "Anything you can do, I can do better ..."
-- 9:10am - 9:45am: Feed and Mom watches Up All Night from last night. A must-see for any parent. While feeding the cats are fighting loudly ... they always do this when they know I'm immobile. This time it gets more serious and I hear the table in the front hallway crash down and something breaks, I know it's the vase. 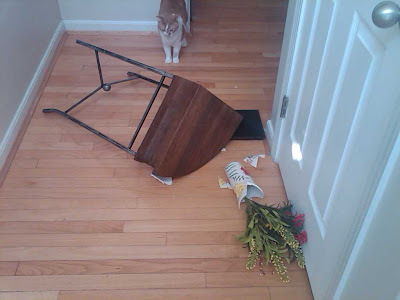 I loved that vase, dang it! I envision murdering Milo, but then decide I don't know how to dispose of a dead cat and also wonder if I'd be arrested. I don't have time to deal with the police or PETA, so I call Mike and calmly tell him what happened as not to disturb my almost-asleep baby. ﻿-- 9:45am - 10:15am: Clean up the foyer. Take Milo to the basement bedroom and outfit him with a small bowl of food, water, and a makeshift litter box. He is the instigator and I plan to leave him down there all day. I brush Daisy in the meantime and I can tell she's thankful for the reprieve. -- 10:15am - 11:30am: Finish packing Anna's items to drop off at day-care and begin to write a note about her daily routine, adorable habits etc. Have a total meltdown during this and call my Mom and Mike, one after another, hysterically crying. Mental note: Although physically closer than a tissue, paper towels do NOT do any wonders for your under-eye circles when wiping tears away. -- 11:30am - 12:30pm: I should work-out, but I'm still a little emotional, so I fold the load of darks I started earlier, finish gathering items for my trip to day-care, shower and get ready. Anna is waking up from her nap and we change clothes for the day and feed. -- 12:45pm: Gigi arrives to hang with Anna for the afternoon. -- 1:10pm - 4:15pm: Run errands ... hit up the tire store first to have a tire patched and all rotated, apparently I ran over a nail at some point. Stop at JCPenney for a new nursing bra and a robe, browse around for a few minutes, shocked at the number of people in the store mid-day on a Thursday ... wonder if it's Social Security check day ... Run into Home Goods to see about pillows for the living room and purchase a few baskets for a bookshelf and two picture frames to take for my desk at work next week. Pick up the pants I dropped off earlier in the week as I head toward home. Stop at Anna's daycare to drop off paperwork and tuition, make her crib and assemble her "supplies" (diapers, wipes, sleep sacks, etc), chat with Miss Patty and Miss Wanda for a few minutes, they are excited to see her on Monday. Pat myself on the back for not crying in public OR in the car, and grab a car wash on the way home. -- 4:15pm: Return home to Anna napping on Gigi's lap. My heart melts. Soooooo much fun with Gigi really wears a gal out! ﻿ -- 4:15pm - 5:00pm: Hang out with Gigi and Anna, check out the new pillows (they don't match and I'll return them), put other purchases away, snack on a Honeycrisp apple (my FAVE!!!). Let Milo out from solitary; he acts like he's been in there for 6 days as opposed to 6 hours. -- 5:30pm - 6:30pm: Say good-bye to Gigi, Mike and Anna hang out while Mom blogs and does some chores around the house. -- 6:30pm: Feed the little Miss again. During her feeding we decide to bag leftovers for dinner and go with take-out. -- 7:00pm: Anna goes down, Mike leaves to pick up dinner. While he's gone, I start removing books from a bookcase to make way for baskets to store my "stuff" and also start going through an old photo album containing pictures from my senior year of high school and freshman year of college ... (1) I honestly don't think any of my friends look a day older and (2) I would KILL to have that body back ... why, oh why did I think I needed to diet in those days?!? -- 8:00pm and on: Watch TV with Mike, blog quickly ... decide that you guys (and me) have probably had enough of my week ... tomorrow is my last Friday of maternity leave and I think I'll spend it snuggling with my little gal rather than worrying about capturing our day : ) Tomorrow night I have a painting class with a friend ... yes, you read that correctly, I'm going to a painting class, and Saturday we have our neighborhood block party ... I need to think of a side dish to make ... any suggestions? Never in a million years did I think that having a baby would change my life in so many ways and I seriously wonder what the heck I was doing before Anna was born that I thought was so time-consuming?!?! 4:00am - 5:30am: I hear Anna moving around in her crib through the monitor and assume she's working out a poop. She's on an every-other-day pooping schedule this week and in my delirious state I can't remember changing a #2 yesterday. I doze in and out of sleep. 5:30am: Anna let's out the tiniest cry and I get up to check on her, assuming she needs a poopy diaper change. Wrong, a wet diaper, but no #2. I change her and nurse her, wrapping up around 6am ... she seems sleepy, so I decide to put her back down. 6:00am - 6:15am: Attempt to go back to sleep myself and finally realize it's not going to happen. 6:15am - 7:30am: Shower, dry my hair, respond to a few e-mails that keep getting lost in the shuffle, eat breakfast, and enjoy the first few sips of coffee. 7:30am: Check on Anna and find her in a semi-sleep state and wake her up for the day. Apparently she was multi-tasking during her "nap" and I find the poopy diaper I expected earlier. I'm not sure how she's so adorable even when changing a #2, but she smiles away and we start off our day with a few songs and an extra dose of cute. 7:30am: Feed Anna while watching a bit of The Today Show and then realize this is a prime opportunity to catch up on last night's Glee. Dad comes to visit in the middle of feeding and we have "family time" for a few minutes and he rolls his eyes when he sees what I'm watching. 8:00am - 9:30am: Tummy time, a review of last night's purchases at BRU (you know, in case she takes issue with anything I bought), jumping, and "playing" with Milo. I also sneak in a quick vacuum of the stairs while Anna helps Mike in the study ... the stairs seem to pick up more dirt than anywhere else in the house and they drive me crazy. 9:30am - 10:00am: Feed and Mom wraps up Glee ... I love that show soooooo much. 12:45pm - 1:30pm: Sing songs while diapering and dressing Anna for the day. Feed. Pack up for Gymboree class, our last class until she's able to move to Level 2 ... we've LOVED Gymboree class. 1:30pm - 4:00pm: Travel to Gymboree class, attend class from 2pm-3pm, grab a couple of pictures with Miss Sara. Target is on the way home, so we head in for a few items ... the cats need food and Diet Coke is on sale. Plus I have a $2 Target coupon on Pampers (expiring soon) that I can combine with a $1.50 manufacturer coupon AND Pampers are on sale ... I've become a little bit of a couponer while on leave, especially when it comes to diapers. It started POURING while we were in the store, so that made for an interesting run to the car. during class and she must have worn herself plum out! ﻿4:00pm: Feed and wind down from an afternoon out. I almost finish up Parenthood from last night (geez, I sound like a TV junkie, but I really on watch while we're feeding, and I told myself I'd be totally honest during these posts) and Mike gets home right as we're wrapping up. 4:45pm - 5:45pm: Playtime and I put away Anna's laundry, including a new batch of summer clothes for the "too small bin." Mike popped in and we had fun looking through some of her newborn outfits ... 4 months has FLOWN by. 6:00pm - 6:12pm: Someone is fussy and I think it's time to eat and hit the hay, but Dad insists it's not ... he and Anna play for exactly 12 minutes before he admits I was right. 6:12pm - 6:55pm: Feeding, burping, and down for the night. 7:00pm: Try a new recipe, Shrimp & Grits from Southern Living (recipe to be posted), with Mike's help in preparation and clean-up. ﻿8:00pm: Blog, wind down with a glass of wine and watch a little TV with Mike. I'll likely doze off on the couch within 45 minutes. Gigi (my Mom) is up tomorrow and I'm excited to run a few errands sans child ... not excited that one of them is taking my car to have a slow leak in one of the tires repaired. -- 6:00am: Hear Anna stirring because Milo is outside the door whining for his breakfast ... pray that he doesn't totally wake Anna up and that I can get another hour of sleep ... for some reason I had trouble falling to sleep last night. -- 7:25am: Wake-up startled and shocked that it's almost 7:30 ... wake Anna up for the day while we sing songs and play for a few minutes. Anna feeds while I watch The Today Show. -- 8:15am - 9:00am: Send Dad a "good morning" picture from his girls, tidy up the kitchen, breakfast for Mom, chop celery and strawberries that were forgotten on Monday (I usually chop everything when we get home from the grocery, but again, that Sunday funk has me off a little for the week). Make a grocery list for a quick stop. Sing songs and tummy time for a few minutes. -- 9:00am - 10:00am: Quick trip to the grocery where Anna is admired by the butcher, the Frito-Lay stocker, and the cashier ... it's hard being so cute! On the way home we drop off a pair of pants to be hemmed. I bought a few new pieces of clothing for work over the weekend and I totally feel like I'm getting ready for my first day of school ... got a haircut as well and planning on a mani/pedi next week. -- 10:00am: Diaper change and feeding. -- 10:30am: Anna goes down for her nap. -- 1:15pm: Sing songs while changing Anna's diaper and getting her dressed for the day. Feed and play. -- 2:00pm - 4:00pm: Walk on the Loveland Bike Trail with Megan (Jen's friend) and Cameron "Cam" (Anna's friend) and browse the weekly Farmer's Market afterwards. Head to the pediatrician's office to pick up the daycare paperwork, Anna takes a short nap in the car. Flowers from the Farmer's Market ... a cheery addition to the kitchen. ﻿-- 4:00pm - 6:15pm: Play at home, greet Dad after being gone for a night, practice sitting up in the Boppy, Jump, read nursery rhymes, and pet the cats. -- 6:15pm: The fussies set in and we change for bed and feed. Dinner goes in the oven. -- 6:55pm: She's out cold and Mom feels good knowing that all is right with the world after watching the evening news. Transfer to the crib is sucessful! -- 7:00pm: Mike and I enjoy dinner, pausing to capture my plate on camera for blog posting at a later date. -- 7:45pm: Jen heads to BRU for daycare supplies (extra sleep sacks and crib sheets) and to stock up on diapers ($25 gift card with the purchase of diapers and wipes) ... it's amazing what a solitary drive and shopping trip will do for the soul. -- 9:00pm: Back home, fight with camera a bit more, blog and settle in to watch a little TV and pump before bed. Tomorrow is Gymboree, so I need to remember to pack socks, a blanket and "Gymbo" for class. Being generally cute while Mom changed clothes for our walk yesterday. -- 6:30am: Up a little earlier than usual, I heard Anna stirring as Mike's alarm went off and knew I wouldn't go back to sleep, so we all rose before the sun. Anna feeds while Mom watches Local News and The Today Show. It's POURING down rain! -- 7:15am: Breakfast for Mom, tidy up the kitchen and family room while Anna plays in her Bumbo, and we visit with Daddy before he heads out for two days. -- 8:00am - 9:00am: Playtime on the activity mat, jumping, books, and tummy time. -- 9:30am: Down for her morning (ok, let's be serious, only) nap. -- 9:30am - Noon: Misc house chores ... tidying up, folding laundry, read a bit of Southern Living while eating lunch (turkey sandwich and an apple) and decide on the remaining meals for the week. (Normally all grocery and meal planning is done on Sunday, but I was in a funk and broke down about going back to work, so I put it off until today), showering and actually styling my hair as I'd gotten it cut on Sunday and wanted to see if I could manage the shorter "do" on my own. -- Noon: Wake Miss Anna up from nap time (yes, she'd gone on 2 1/2 hours! 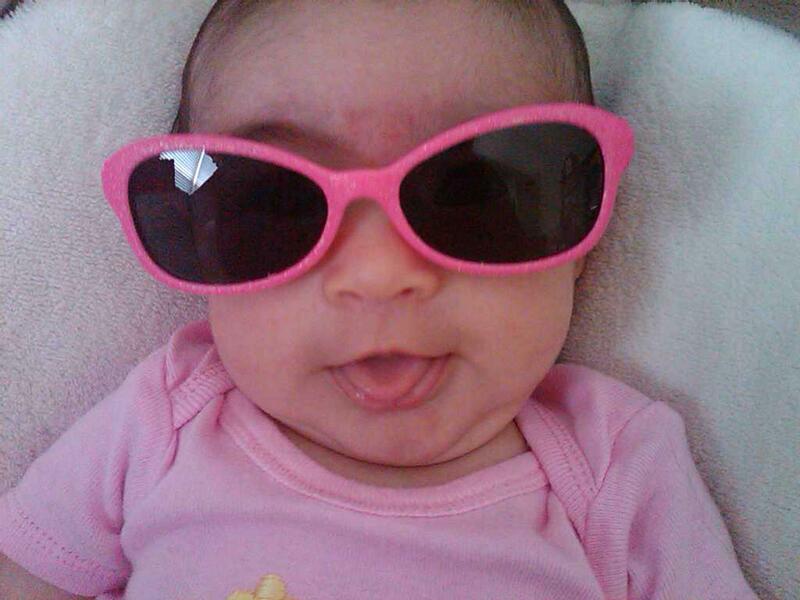 ), diaper change, sing songs, dress her for the day, and a feeding. -- 1:00pm: Play for a few minutes, then load up for afternoon errands. A perfect fit for our Anna Banana!! ﻿ -- 4:00pm - 5:30pm: Cuddle-time and playtime with Mom, call Grandma, call Dad, and general afternoon fun. -- 5:30pm: Someone starts to get a little fussy and the weather has done a complete 180 from the morning rainstorm, so we pack-up and head on a walk in the Baby Bjorn. As I was changing clothes, I laid Anna on our bed for a second and when I turned around she was being the cutest thing ever, so we had an impromptu photo shoot (proof to come, issues with downloading pictures right now). 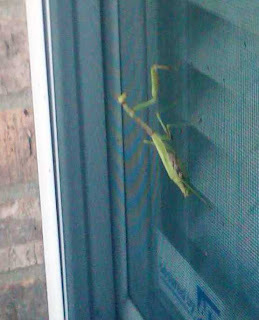 -- 5:50pm: Finally head out on our walk, notice a praying mantis on the window, take a picture to send to Paw Paw, knowing he'll love it. -- 6:15pm: Walk is over, fussies have set in and there's no use in fighting a feeding and bedtime. Sing songs while diapering up and changing into a sleeper. -- 6:15pm - 6:45pm: Feeding and cuddles with Mom. -- 7:00pm: Anna goes down for the night. -- 7:00pm - 11:00pm: Tidy up the house, make dinner for myself (salad and leftover spaghetti with bolognese sauce from Sunday), talk to Mike, and spend several hours hanging rods and new curtains in the living and dining room (a surprise for when Mike comes home on Tuesday ... we'd started the project over the weekend, but ran into a bit of a snag). -- 11:00pm: Pump and indulge in watching E! News for a few minutes before enjoying a sugar-free Dark Chocolate Jell-O pudding pack and heading off to bed. 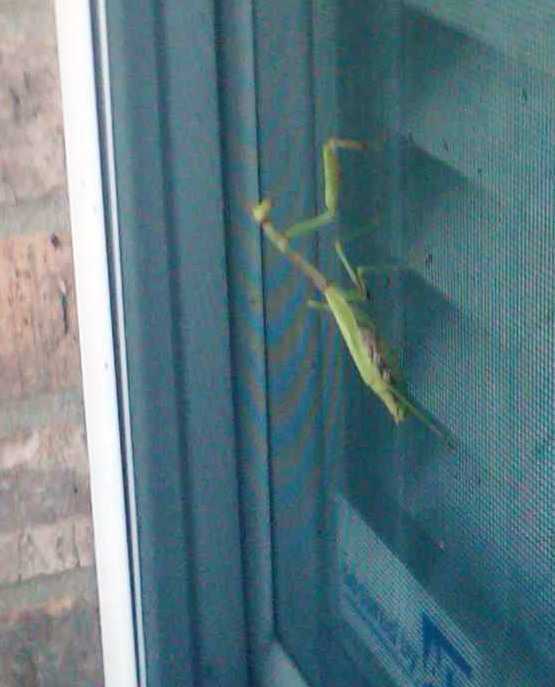 -- Overnight: My dear friend, April, delivered her baby boy ... I was very reminiscent as I dozed off and couldn't wait to hear the good news when I woke up! D-day as I like to think of it is drawing near ... my return to work happens on October 6, two weeks from yesterday. I'm dreading it, but am also hopeful and optimistic that the change will be good for everyone. I'll desperately miss spending my days with Anna, but if her reaction to the other babies at Gymboree class or during outings with our friends is any indication, she will thrive in a daycare environment. I know that the structure will be good for me as well, but that's not to say the transition will be easy. I chose to return to work on a Thursday based on recommendations and also knowing that easing into the change would be beneficial all-around. Anna will go partial days on Monday and Tuesday of that week while I head to doctor appointments, run errands, and cry in my car. Wednesday will be a day dedicated to Anna and Mommy with lots of hugs, kisses, and cuddles. I've been extremely lucky to have spent 20 full weeks at home and Anna will be 4 1/2 months old on her first day of "school." I work for a wonderful firm with a fantastic leave policy and because we'd saved up appropriately, I was also able to take a little over three weeks of unpaid time. I've tried to take on a "never say never" approach to parenting, and that, combined with an extremely laid-back and happy baby, have served me well thus far. In that regard, I'm being optimistic about this next phase in our lives; although the tears I've shed each day this week would indicate otherwise. I know Anna will be fine, I know that I'll survive the pangs of guilt and will acclimate to the new schedule and demands of working full time. Most importantly, I know that I love my daughter and my family more than I could ever express and this is what's right for our family right now. Another round of shots are under our belts and while the tears were kept to minimum this time, the compliments on cuteness, excellent sleep patterns, and proportionate growth were being thrown around by the nurses and doctor alike. I felt the need to ask about Anna's lack of an afternoon nap and was immediately shushed by the doctor after he heard she's sleeping 7pm to 7am straight with a 2-3 hour morning nap. He also asked me to keep my trap shut when discussing sleep patterns with other local parents as he didn't want to start receiving complaint calls when they realized their children are nowhere close to sleeping as well : ) We talked about starting solid foods, and although she's cleared from an age perspective, we're going to wait until she's closer to 6 months for a couple of reasons; they aren't nutritionally required until then, especially since she's still breastfed, and we're transitioning to daycare in two weeks time, for both baby and Mama's sake I'd like to settle into that routine before throwing another bend in the road. Everyone told me that time flies once you have a baby, but I had NO IDEA just how quickly until Anna arrived ... looking at the pictures below has me nostalgic about the past and excited for the future at the same time, I simply can't believe how much she's changed in 18 weeks! Seriously ... does it get any cuter than this smiley girl?!?! What a whirlwind month for all of us! You travelled to your fourth and fifth states (MD and DE), enjoyed a week at the beach, dipped your feet in the Atlantic Ocean, swam in a pool for the first time, and spent four uninterrupted days with your Grandma and Grand-pap in Pittsburgh. Whew, I'm tired after just typing that sentence! As usual you excelled at travel and your easy-going, laid-back attitude made for a wonderful vacation. You found your voice this month and we absolutely love hearing you talk! You were babbling here and there before we left for vacation and belly laughed for the first time during a dinner out in Bethany Beach; I almost cried sitting at the table while you chuckled. The next week, during your time in Pittsburgh, you had a lot to say and finally found a way to tell us, and in the sweetest possible way; your Grandma and Grand-pap were tickled pink to bear witness to this. You come from a long line of talkative women, so this is no surprise and I look forward to hearing your take on the world around you. On the flip side, I asked your Grandma to remind me how thrilled I was that you'd found your voice in a couple of years and again in about 13 years. Your cheery disposition and great sleep habits have kept up and you are always a happy surprise to waiters and the other diners when we are out for a family meal. You continue to dabble in both taking a pacifier and sucking on your hand / fingers / thumb. I appreciate that you're keeping an open mind and don't blame you for not wanting to commit as it generally means that one way or another we're able to calm you down during the rare instances when you develop a case of the "fussies." You're still our petite little girl, wearing mostly 0-3 month clothing, but growing out of more outfits each day, especially lengthwise, and with fall right around the corner I've been washing up lots of new outfits. You're very strong for your age (compared to other babies your size) and it's the cutest thing ever to see you in more grown up positions, such as sitting on my lap during church or while we eat out, and in your Jumperoo at home (where you are sandwiched between two hand towels). I went on a mini-shopping spree for you a couple of weeks ago; you needed new socks, but I went prepared with a return, a coupon, and a gift card. The Carter's store didn't know what hit them and I quickly realized just how addicted I am to baby girl clothing. I'll have much less time for our casual errands and shopping soon … I'm returning to work in three weeks and am preparing myself for the worst, but hoping for the best. I can't imagine anyone giving you better care than me, but know you will thrive in day-care / school and, at some level, I'll enjoy the change of pace that work provides. In the meantime I'll been savoring every last minute, smile, coo, and snuggle that I have with you during these precious days. I have truly enjoyed each and every day we've had together and it's simply amazing how quickly you are growing and changing. Your antics, expressions, laughs, and (now) words are what your father and I talk about even after you are fast asleep; to say we are obsessed with you is an understatement. Eventually you'll use your words to express how displeased you are with me (and no, you cannot wear that low-cut shirt in 12 years! ), but I'll still love you more than you can imagine, will care for you unconditionally, and I hope I will always be the one person in your life you can talk to about anything. We didn't break out Anna's swing until about 6 weeks ago as she just seemed too small for it when we brought her home and we preferred to use her soft and snuggly bouncy chair when she was still a wee little one. I wouldn't say the swing works wonders on her or lulls her to sleep like it seems to do for some babies, but it's a nice change of pace for her in the afternoons and gives her some time to herself without much stimulation (the seat also detaches and can be used as a boucy chair, which is perfect now that she's a little bigger). The added plus is that she seems totally enamored with the turtles that hang from the bar above her head. This is generally what she does in her swing, just makes eyes at the turtles and babbles about her day. I'm glad she's found "friends" because she (hopefully) won't have any siblings for a bit longer. We broke out Anna's "Jumperoo" a few weeks ago seeing as how she prefers to be in-motion and looking around at the world. Granted we have to wedge her petite little body in with towels and she's still getting the hang of it, but if the pictures below are any indication, I think it's destined to be a fave! I just can't get enough of these little piggies! Isn't it adorable how she curls her tiny toes up? My friend Amber is a talented writer and photographer and never fails to amaze me at what she's able to articulate with her words and photos. Click here to see her latest blog post featuring Miss Anna and a few of her future BFFs. The photos were taken at a cookout hosted in Lexington a few weeks ago where several old friends gathered with our little princesses, spanning 1 1/2 years old to 3 weeks ... I have a feeling this bunch is going to give us a major run for our money! And while you're admiring Amber's work, feel free to check out this post, one of my all-time faves! Here's to keeping the clouds away! (Do you have that Sesame Street jingle in your head now? You can thank me later, ha.) It's finally time for our first family vacation and I'm not planning to blog much, if any, while we're away. All hope is not lost; I've pre-posted a bit to keep from losing my eight diligent readers. After a week at the beach we'll be staying in Pittsburgh with Mike's parents for a few days while Mike attends a sales conference for work; his company is headquartered there and the timing was perfect. An added plus is that Anna will be able to take in her first Steelers regular season game with a crowd full of fans. Those black and gold die-hards like to start 'em early! I'll likely be a few days late with Anna's four-month-letter, but it's been started and will definitely be published ... and shortly thereafter we'll have official stats as she sees her pediatrician for a check-up and "jabs" on the 19th. Feel free to leave your guesstimate of her weight and height as a comment in the meantime. 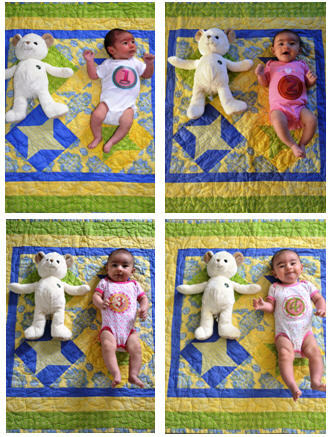 Click here to see her two month stats and here to review her three month photo.